1936 EL Replace Valance This is how I got this Job, It had already been done at another automobile body shop. They should not touch this stuff! The workmanship and quality only damage motorcycle parts. The valances were in such bad shape after the previous shop it only made sence to remove the existing valances front and rear and replace. This is the inside of the 36 rear fender. Paint over dirt, overspray, welding slag. Unacceptable for a $100K + machine. 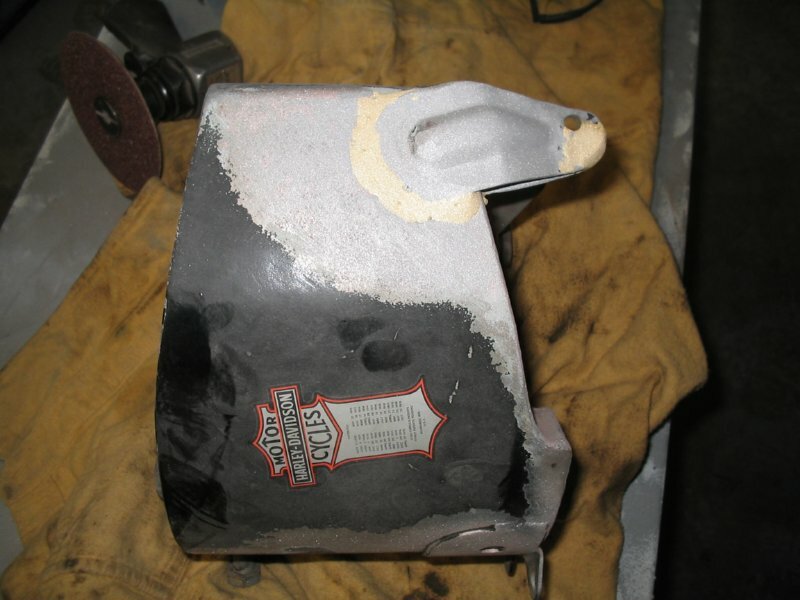 1936 EL Rear fender. This is an automotive body shops idea of a good job. Twisted rear braces, these actually do not fit the motorcycle. Rear fender with the valance removed. Rear fender with a LOT of body filler in it. Front fender, the start of valance fitting. Rear fender, the start of valance fitting. Fitting the rear fender using a tire to verify center location. The tanks were painted even though they leaked gas. Leak in the left tank fixed. We test with 3lbs of air. This is sufficient for a gravity feed gas tank. Skim coat of filler on the tanks. Another shot of the tanks. Inside of the front fender. Notice the valances are installed with NO filler. Front and rear fender ready for zinc and primer. Rear fender needed a new taillight wire tube. 1936 EL Frame This is an original. We took numerous pictures of it for reference. It had been repaired and looked to be a good job. 1936 EL Oil Tank George Tsunis project. Something this rare and valuable deserves special attention to each step to document the procedures. We are taking the brazed primary cover hanger off and puting a new replacement on. Another picture of the mount. Unfortunately the tank had been chromed and the repairs were done with brass. Neither are friendly to the repair process I will use. I have to remove ALL of the contaminent to properly weld the new mount. Another tear in the top of the tank. Somebody decided to use a coarse gringing disk to remove chrome and ground right through this corner. you can see 2 pinholes in the bottom. Another hole in the corner. The digs you see on the metal surface are from a coarse grinder. All of this is a problem for me, and expensive to repair. Oil tank and frame painted. Notice on the casting, we do not bury casting numbers or halmarks. This is done by controling the primer and paint process. And never powder coat, it will hide these important casting marks. Frame looks beautiful. This is Brilliant Black. Rear section , fromt fender brace. Front half of front brace. Brace as it comes out of the form. I know they never looked this straight new, but this is how it's done here. 1936 EL Before any priming can be done, numerous tears rot holes twists, and dents have to be metal worked and then a skim coat of filler applied inside and out. All bare metal is etch primed before any primer surfacer can be applied, without this paint failures accur within a year, this step is invisible to the consumer, so often shops that are loosing money on a job like this skip this step. We use a high end surfacer. We will guide coat and block this as many times as it takes, two is usually enough. 1936 EL Sheetmetal Done Often people say "They never looked that good new" My answer is this, they weren't worth $100K new, and more each year. Let me recount a story my father told me. He worked at " Pete Andrews Indian Sales "in Roxbury Mass after the War. His friend Vaughn Monroe was a big band leader and when Monroe was to get a new Chief, My father went to Springfield to be sure he got a perfect motorcycle. not a farmers bike. Monroes picture would be on magazines and he needed to be on a prime example. That said, I;m sure Clark Gable got similar treatment from Harley-Davidson. I build the motorcycle celeberties would have gotten. And yes, Some looked that good new. Teak Red top of rear fender. Teak red top of front fender. Decals applied on the gas tanks. We use fine line pinstripe tape to properly place the decals. Then the pinstriper uses tape as a guide for his stripe. at no time does the stripe touch the tape. doing that would create a square line. this particular pin striper, Bruce Deveau, is the the best I've ever seen, or had the privelage to stripe my work, and I''ve known numerous stripers. After the stripes dry over night , a coat of Spar varnish is applied , by brush . After the decals and the stripe were applied, we then applied a catalysed Spar Varnish. This same varnish was used over all the stripes on this bike, as it came from Milwakee, so we did the same. We were fortunate enough to be loaned an original 1936 VL new old stock Teak Red and Brilliant Black Rear fender. Thank you Steve at the 74 Shop, Bob Provencher and Dan Henke for their generous help. In the interest of preserving history, they went out of their way to help me. Two shots of the new old stock fender next to George Tsnuis' 1936 EL fender, there can be no question as to color stripe patterns start and finish of the strips, interestingly, the stripe on the black is not Teak Red, it is slightly orange, more of a Chinese Red . These are more shots of the sides of the rear fender the stripe is so perfect, a focused look is needed to reveal the brush work. Two nice shots of the gas tanks. The front of the fender received a lot of metal finishing, it had been in several collions , the finished product is well worth the time as is evidenced by the two-tone with the stripe. We made tools to pean the rivitts over , as O.E.M. , it makes for an authentic repair . Each year Judging gets better , driving the quality of the retorations , to stay ahead of this you need to duplicte the origonal manufacturing methods , despite the often poor quality of the parts . These shots show the replaced valances, stripes, the fenders look at least as good as new. The 1936 and 1937 fenders used a butterfly strap over the fender brace. Front and rear. These 2 shots are of the finished inside of the front fender.We spent a lot of time on this Chevron stamping to retain its shape inside and out . The rear looks the same. This N.O.S. 36 VL fender did not have the Butterfly straps on the inside . With the steady increase in the Knuckleheads collectability , the inside finish has now become an important factor in it's value .